Moscow denies the report, describing the allegation as "bogus. "Bellingcat reported Wednesday that the man identified by the British as "Ruslan Boshirov," one of two men suspected of poisoning Skripal and his daughter in the UK in March, is GRU Col. Anatoliy Vladimirovich Chepiga, whose name was found on a list of people receiving the Hero of the Russian Federation award in December 2014, according to Bellingcat.British authorities said that "Boshirov" was an alias when they named him and "Alexander Petrov" as the suspects in the attempted killing. Prime Minister Theresa May also maintains she believes the men were traveling under aliases.Bellingcat says the identification is based on its own investigation, and was confirmed by "multiple sources familiar with the person and/or the investigation. "UK officials have declined to comment to CNN on the report.Responding to the report on Facebook late Wednesday, Russian Foreign Ministry spokeswoman Maria Zakharova described it as "bogus" and part of an "information campaign, the main task of which is to divert attention from the main question: WHAT HAPPENED IN SALISBURY? "Zakharova repeated her assertion that "there is no proof" that Russia was involved in the attack. Earlier this month, following the release of the names "Petrov" and "Boshirov" by the British authorities, Russian President Vladimir Putin described the two suspects as "civilians." He said Russia had identified the pair and found no evidence of criminal activities. 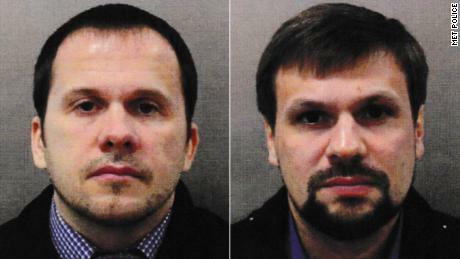 In an interview broadcast on the Kremlin-backed RT network the following day, the two men admitted visiting Salisbury — the city where the poisoning took place — but denied carrying out the Novichok poisoning, saying that the purpose of their trip was to visit the city's historic cathedral.The Bellingcat article says Chepiga was born in April 1979, in the tiny village of Nikolaevka near the Russia-China border. He enrolled in an elite military school at the age of 18 and graduated with honors in 2001, Bellingcat asserts.From there he was assigned to an elite military brigade under GRU command and was deployed to Chechnya three times, Bellingcat says, adding: "The specific operations he was involved in are not known. "Chepiga's name was also found on a list of people receiving the "Hero of the Russian Federation" award in 2014, according to Bellingcat.The entry, on the website of the military school Chepiga attended, is unusual in that it contains no details about the reason for the award. CNN's Emma Burrows, Lindsay Isaac and Nick Paton Walsh contributed to this report. Games with Gold April 2019 free games latest as Xbox reveal new Deals with Gold games (Pic: Microsof.. This is the first time that Jews who lived in Algeria between July 1940 and November 1942 have been ..